With my daughters recently back to school I was keen to get out and do some serious birdwatching and try and spot a few summer migrants on their way back to winter quarters. Berry Head seemed like a good option, a headland jutting out beyond Brixham at the extreme tip of the southern arm of Torbay. I was pleased to see so many resident pebble-chinking stonechats, but not much sign of migrants. A solitary Wheater flitted discretely on the steep slopes. 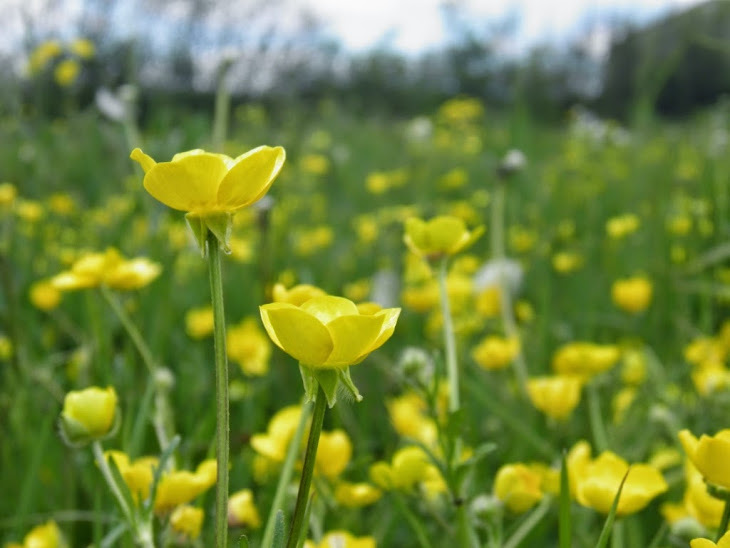 It did not take long before my eyes were heading downwards rather than to the skies – the abundance of late summer wild flowers caught most of my attention. Berry Head’s thin limestone soils mixed with salty air have created a special botanical habitat. The last blue flowers of Viper’s-bugloss (Echium vulgare) clung to the tips of arching flower branches ending their summer show, whilst the tiny blue lily flowers of Autumn Squill (Scilla autumnalis) were in their prime scattered widely on the cliffs. Sea specialist, Rock Samphire (Crithmum maritimum) was most abundant on less accessible rocky slopes providing late yellow warmth to the cliffs. 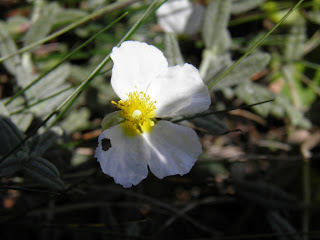 However it was a nationally rare species that I was eager to find, the White Rock-rose (Helianthemum apenninum), a limestone specialist restricted to a few locations in the South West. It occurs on dry, rocky limestone grassland on south facing slopes (Countryside Trust, 2011), typical of montane Mediterranean habitats where is more commonly found. However the conditions provided by the Devonian limestone sea cliffs of Berry Head provide sufficient conditions for the White Rock-rose to prevail, although threats from scrub invasion, trampling and dog fouling put this at risk (Countryside Trust, 2011). In the UK it is at its northern European limit (Preston, 2007). The White Rock-rose flowers between April & July (Rose, 2006), and so I was being rather optimistic to see it at its best. Just when I was giving up any hope of finding it, there was one last solitary flower already in decline having shed one of its petals. This contrasts with the small silvery downy leaves, strongly inrolled at their margins. Next year I will be visiting much earlier, perhaps to time in with the return of the summer migrants. Rose,F (2006) The Wild Flower Key – How to identify wild flowers trees and shrubs in Britain and Ireland. London: Penguin Books Ltd.